Throughout the history of the Christian Church, the Virgin Mary has been the focus of unparalleled love and devotion and the subject of fervent prayer. In this light, the community of Saint Vladimir’s Orthodox Theological Seminary here invites the faithful to their annual open house and fall festival, to be held on the campus on Saturday, October 1, 2016—the Feast of the Protection of the Mother of God. In celebration of the life and person of the Theotokos, renowned scholar Dr. Mary B. Cunningham, author of Gateway of Life: Orthodox Thinking on the Mother of God, will present the day’s keynote address. Dr. Cunningham is Honorary Associate Professor in the Department of Theology and Religious Studies at the University of Nottingham, United Kingdom. 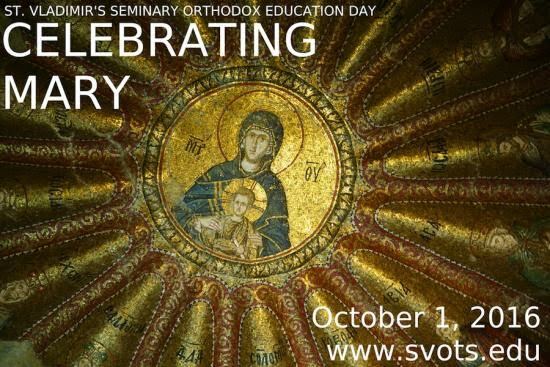 The day will be filled with liturgical services from the Eastern and Oriental Orthodox traditions, representing the diversity of the seminary’s student body. Presentations will be offered on various topics, such as the iconography of the Akathistos Icon and the ministry of All Saints Greek Orthodox Monastery, Calverton, NY, which focuses on providing services to survivors of human trafficking. A marketplace filled with international cuisine and Orthodox Christian books and gifts also will be available, as will special activities for children throughout the day. Three Hierarchs Chapel and the seminary bookstore will be open to the public throughout the day. Admission is free. A flyer is available on the seminary web site.